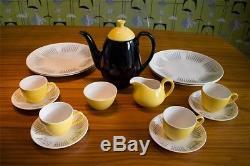 Vintage coffee set and plates from Ridgway Potteries in the Park Lane Pattern. I think this dates from the late 1950s or early 1960s. Items are in Ridgway's'metro' shape, as used in the production of the Homemaker items for Woolworths. 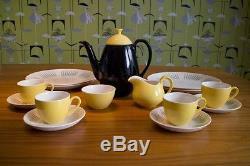 A really lovely set for collectors of vintage ceramics. Would make a great start to a collection in the range. 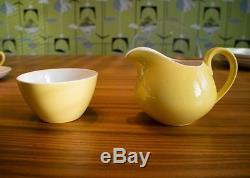 Plates and bowls crop up for sale online, however I believe the coffee pot, jug and bowl are very rare. In really great condition for its age. Items are in excellent condition, except for some very minor imperfections as outlined below. 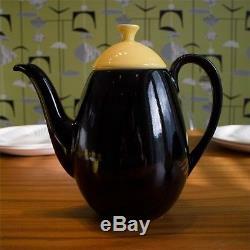 Coffee pot in black with pale yellow lid. 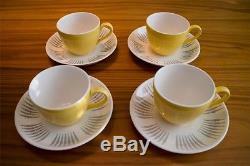 4 small pale yellow coffee cups and white saucers with black lines design - one cup appears to have some slight crazing to the outside, which is hardly noticeable. 2 of the saucers have slight manufacturing imperfections. 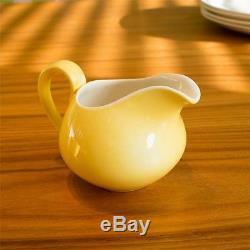 Small sized milk jug and sugar bowl in pale yellow - there is some patchiness to the colour on the jug, from manufacture. 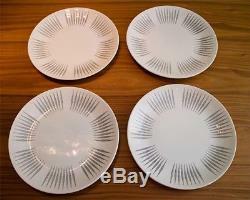 4 small dinner/large side plates (9 inches or 22.5cm) - all plates have some cutlery marks consistent with use. Items are unstamped or have one of the 2 stamps shown in the photos. 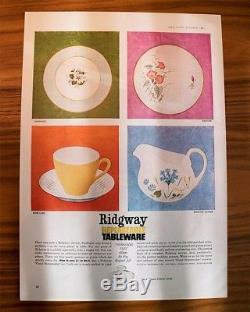 Also included is a Ridgway advert from Ideal Home magazine in October 1961 featuring the Park Lane range. This is an original cut out from the magazine (not a copy). Fits in an A4 frame. Items are from my own collection, which I have decided to consolidate. Please note that due to the weight of the items, I will need to send in 2 packages. I will only be able to post this to UK addresses. The item "Rare Vintage Ridgway Park Lane 1950s 1960s Coffee Pot Set and Plates Homemaker" is in sale since Monday, February 05, 2018. 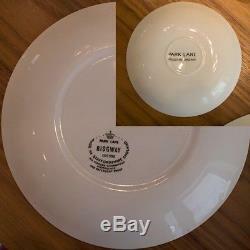 This item is in the category "Pottery, Porcelain & Glass\Pottery\Ridgway". 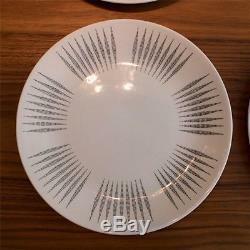 The seller is "fiona3664" and is located in Glasgow. This item can be shipped to United Kingdom.